Herbs, perennial. Roots fleshy, stout, tufted. Stems cespitose, usually erect to ascending (rarely decumbent, rooting at nodes). Leaves: leaf sheath auriculate at apex; blade sessile or petiolate, linear to lanceolate (rarely lanceolate-ovate), 5--15 ´ 0.3--4 cm, apex acuminate (rarely acute). Inflorescences: distal cyme vestigial, included; spathes solitary or clustered, green, pedunculate, not at all to strongly falcate, 1--2.5(--4) ´ 0.7--1.5(--2.5) cm, margins longly connate, glabrous except along connate edge, apex acute to acuminate, sometimes purple, usually variously pubescent; peduncles 0.5--1(--2) cm. Flowers bisexual and staminate, 1.5--4 cm wide; proximal petal minute, white, distal petals blue (rarely lavender or white); staminodes 3, staminodes and medial stamen entirely yellow; antherodes cruciform. Capsules 3-locular, 2-valved (very rarely 3-valved), 3.5--4.5 ´ 3--5 mm; abaxial locule warty, indehiscent (very rarely smooth and dehiscent); adaxial locules smooth, dehiscent. Seeds 3, brown, with soft, whitish tissue at both ends or in a band, 2.4--3.5 ´ 2.3--2.8 mm, nearly smooth. 2n = 60. Flowering spring--fall. Rocky woods and hillsides, scrub oak woods, pine woods and barrens, sand dunes, hummocks, shale barrens, roadsides, railroad rights-of-way, fields, and occasionally a weed in cultivated ground; Ala., Ark., Ariz., Colo., Del., D.C., Fla., Ga., Ill., Ind., Iowa, Kans., Ky., La., Md., Miss., Mo., Nebr., N.C., N.J., N.Mex., N.Y., Okla., Pa., S.C., Tenn., Tex., Va., W.Va., Wis.; Central America. Commelina erecta grows in temperate regions of North and Central America, as well as in tropical regions. This is by far the most variable species of Commelina in the flora. Three freely intergrading varieties may be recognized, although they are of questionable significance: C. erecta var. erecta, with larger leaves lanceolate to lanceolate-ovate, (1.5--)2--4 cm wide, and spathes (2.2--)2.5--3.6 cm, occurs throughout our region; C. erecta var. angustifolia (Michaux) Fernald, with leaves linear to narrowly lanceolate, 0.3--1.5 cm wide, and spathes 1--2 cm, is mainly southern but extends as far north as Virginia; and C. erecta var. deamiana Fernald, with leaves linear to narrowly lanceolate, 0.5--1.7 cm wide, and spathes 2--3.5 cm, occurs in midwestern United States south to Texas. Plant: Perennial herb; roots fleshy, tufted; stems erect or ascending, freely branching Leaves: sessile or petiolate, linear, lanceolate to lanceolate-ovate, 2.5-17 cm long, 0.3-3 cm wide, the apex acuminate, rarely acute INFLORESCENCE: solitary or clustered spathes; peduncles 0.5-1 cm; spathes 1-2.5(-4) cm long, 0.7-1.5(-2.5) cm wide, the margins fused at the base, glabrous except for fused edge, the surface green usually variously pubescent, the apex acute to acuminate; upper cyme lacking Flowers: perfect and staminate, 1.5-4 cm wide; upper petals blue (rarely lavender or white), the lower petal minute, white; staminodes and medial stamen anther entirely yellow Fruit: FRUITS 3.5-4.5 mm long, 3-5 mm wide, 1 locule warty, indehiscent and 2 locules smooth, dehiscent; SEEDS 3, brown, with soft, whitish tissue at both ends or in a band, 2.4-3.5 mm long, 2.3-2.8 mm wide, nearly smooth Misc: Grasslands to meadows in mesquite woodlands to pine forest on granitic and limestone substrate; 1150-2300 m (3800-7600 ft); Jul-Nov REFERENCES: Puente, Raul, and Robert B. Faden. 2001. Commelinaceae. J. Ariz. - Nev. Acad. Sci. Volume 33(1). Perennial herb to 1 m tall Stem: erect or ascending. Leaves: 4 - 15 cm long, 0.5 - 4 cm wide, linear to lance-shaped with a pointed tip, the leaf base curling around the stem to form a 0.9 - 2.2 cm long sheath with a rounded lobe (auricle) at the tip and tiny hairs along the margin. Inflorescence: terminal, subtended by a sheath-like structure (spathe) with a fused margin in the lower one-third, green, solitary or clustered, semi-triangular with a pointed and sometimes purple and hairy tip, usually having conspicuous and radiating cross-veins. Flowers: with three somewhat unequal sepals, three clawed petals with two blue upper petals 1 - 2.5 cm long and a much smaller white lower petal. Fruit: a three-chambered and two-valved capsule, 3 - 5 mm long, two chambers smooth and opening at maturity and the other usually warty and remaining closed, containing three nearly smooth brown seeds with soft whitish tissue at the ends or in a band. Similar species: The similar Commelina communis is an annual with erect or decumbent stems, branches that often root at the nodes, leaves that are lance- to narrow egg-shaped, and spathe margins that are not fused. Habitat and ecology: Locally growing in sandy soils, and fairly common in the Kankakee river valley. Etymology: Commelina was named after the three Dutch botanists in the Commelin family, Johann (1629-1698), Kasper (1667-1731), and a third who died at a young age. Linnaeus felt the flowers represented the three botanists, each flower having two showy petals and a third inconspicuous petal, referring to the two acomplished botanists and the third who died before accomplishing anything of great botanical significance. Erecta means upright. I found a specimen along the roadside 2 miles west of Yankeetown, Warrick County, which I am referring to this species. Pennell (Bull. Torrey Bot. Club 43: 107. 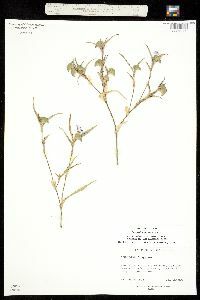 1916) reported two specimens from the dunes about Lake Michigan as Commelina crispa Wooton and I am including them in this species. The name of this species should not be confused with the same name applied to other species by early authors. [in more recent treatments C. angustifolia is conspecific with C. erecta. However, according to Deam, C. angustifolia has linear leaves and shorter posterior petals (ca. 10-15 mm long). This form grows in almost pure, fine sand and is found on sand hills along roadsides, on high, sandy banks of lakes and streams, and on the open dunes about Lake Michigan. 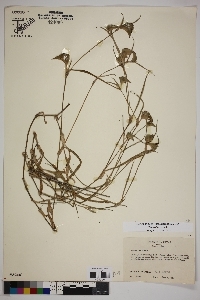 Three specimens were measured in the field and the blades of the posterior petals averaged from 17-18 mm wide and 14-17 mm long and the anterior or white petals averaged about 1 mm wide. Perennial from a cluster of thickened fibrous roots; stems erect or ascending, to 1 m, usually branched; principal lvs linear to lanceolate, 4-15 נ0.5-4 cm, the sheaths white-ciliate, somewhat prolonged at the summit into rounded, often flaring auricles; spathes arising near the summit of the culm, solitary or in small clusters, short-peduncled, broadly semi-deltoid, often with conspicuous radiating cross-veins, the margins connate in the lower third, upper pet 10-25 mm, the lower one much smaller and white; 2n=56-120. Dry, usually sandy soil; s. N.Y. to Pa., O., Mich., se. Minn., Io., and Wyo., s. to S. Amer. ; also Old World. Highly variable, but only with difficulty divisible into vars. Var. erecta (C. virginica, misapplied; C. elegans), with lanceolate or lance-ovate lvs 10-15 ױ.5-4 cm, and with the spathes glabrous or nearly so, is mainly Ozarkian (with us), but extends Ҵhroughout the range of the sp. Var. 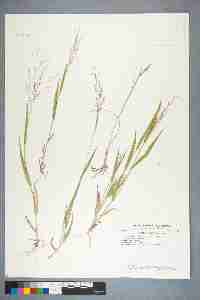 angustifolia (Mich.) Fernald (incl. C. crispa), with linear lvs 4-10cm and small spathes 1-2 cm, centers in Tex., but extends irregularly into our range. Var. deamiana Fernald, with linear lvs 10-15 cm, the spathes 2.5-3.5 cm and often pilose at base, occurs mainly on sand dunes from Ind. and s. Mich. to Neb., occasionally s. and w. to Tex. and Ariz.